In her August 11 editorial, Alexandra Petri asks, “How should we talk about our Olympic women?” Itʻs a call for equity and integrity in journalistic leadership. 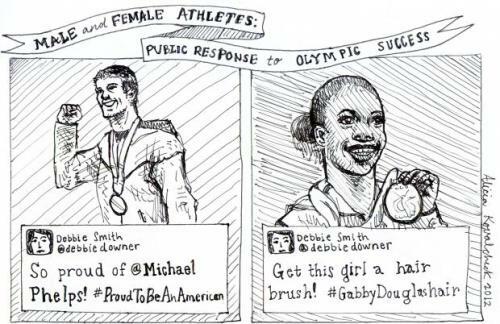 Petri writes: “For many athletes, the Olympics mark the moment when they become celebrities. It is a moment we have not yet mastered, when they climb out of the pool and people ask what they think about the election and who does their hair, not what they ate for breakfast and why they used a particular kick. It is the packaging and the imaging and the talking, not the racing, that we need to worry about. Like Petri, and as a former journalist, I want us to “focus on substance” and with integrity. Following the spin is making journalism into a slavish follower of entertainment, not the nobler principles of the free press. Itʻs a difficult task — news written quickly, on deadline, and in a system that rewards flash as much as (if not more than) substance. Giving in to the seduction of the slick lead and the clever spin is careless followership. Great journalists are leaders-in-the-knowledge-trenches. We need them to lead us, as Petri says, towards substance, an uphill battle in our culture of celebrity and twitter-wit. And as followers of news-of-the-day, we must demand more, too, from journalism and from ourselves. ← Authentic Leadership: Hopeful Buzzword?